Let me introduce a blog post from my favorite Japanese blog. The topic was about ‘a helmet’ displayed at Asahiyama Zoo. 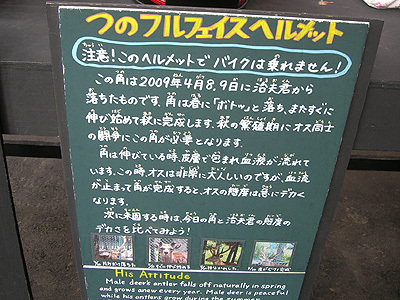 Asahiyama Zoo is one of the most famous zoos in Japan, along with Ueno zoo in Tokyo. Asahiyama Zoo is located in Hokkaido, but there are a lot of people visit Hokkaido only to visit the zoo from Tokyo or Osaka. This is the helmet. It is ‘an antler full face helmet’. People used queue up to take souvenir pictures wearing the helmet. 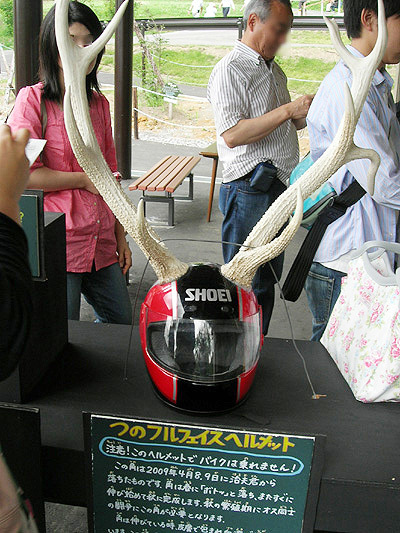 They made the helmet by using the antlers fell off from Haruo, a deer. and by the fall, they will be full-grown. 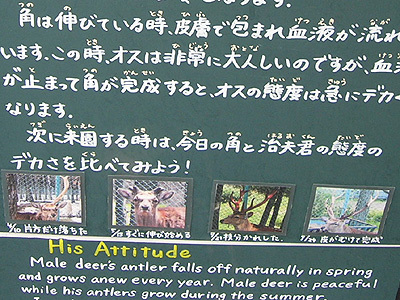 As the antlers becomes full-grown, male deer become cocky. I found out about it for the first time.